Protein powder or protein shakes are some dietary supplement that are usually used to gain weight, improve athletic performance and for quick impacts in muscle building after a huge workout. You can get protein powder or pre workout powder in Dubai in any pharmacy store or special shops for this. Here we are going to describe some benefits of disadvantages of protein shakes if you have are going to use it so that you may aware of it. Protein supplements can be used to lose weight if it is used instead of your regular meal. An average protein shake contains a fewer calories as compared to a full meal. Driving protein shakes is very easy and it can save a lot of your time. You can prepare it in minutes and can drink in seconds. However, most of the people use it with milk. Moreover, you can also use some fruits with it to make a perfect nutritional list. Protein shakes are quite affordable and available in market easily. If you get a full pack of protein powder you will get many servings that reduce the price of cost/ serving and reduce it to $.50 per serving. Although a lot of people use protein powder as lunch or dinner but remember this is not a full meal. A lot of other things that a full meal food provides you like antioxidants etc, a protein shake will not provide you. If it is used properly to loose weight or to improve your workout peformance, it will obviously work. On the contrary if you are not doing workout and you use it, it will increase your weight but not muscles. Protein shakes have sometimes very bad taste and because of this it could be very challenging to drink. Even there are a lot of flavor available but still people prefer to add something with it like milk etc to make palatable. In the protein shakes the most famous brand that people use is gold standard why protein or sometimes people say it whey protein. 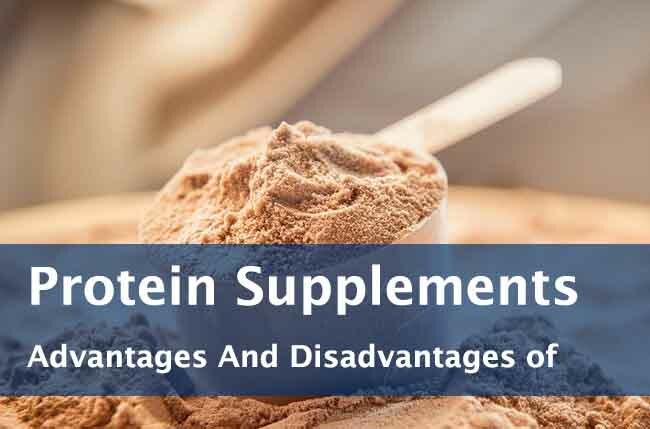 The above discussed advantages and disadvantages of protein supplements are just the shot hints. Sometime it proves a right choice for some people but sometimes not. However, consult with your doctor for any question you may have regarding it.